Batman: The Movie (1966) Dir. Leslie H. Martinson | Cappa Toons! 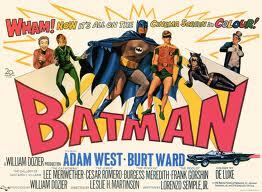 There’s nothing like having a joyous revisit to the comic, tounge in cheek world of the 1960’s Batman. I’ve always loved the original TV show, and the stellar cast of famous movie stars playing the caped crusaders most notorious villains. The hokiness and cheeseball aspects add to the fun, and now here we have one of the great joys of silly cinema, Batman: The Movie! It’s funny looking at this movie today because compared to TV shows that are blown up in budget for major theatrical releases, Batman: The Movie doesn’t feel nearly as big, but more like a more expensive episode of the TV series. But I think that works in the movies favor, in a time when there was no concern to make a Batman movie epic, even for the cheesy 60’s TV series, but the amount of fun the show brings is the same as what’s brought to the big screen. The big aspects of the film are the fact that Batman’s 4 major villains, The Joker, Catwoman, The Penguin, and The Riddler have joined forces to use a dehydrating machine to reduce U.N. officials to dust and take over the world! Mwahahahaha. Along with them are their henchmen, who shout “Yo-ho” after every command, while traveling in the Penguins supersized Penguin shaped submarine. As silly as the film is, I actually found some of the model and effects work to be impressive, even though they were cartoonified to the max. 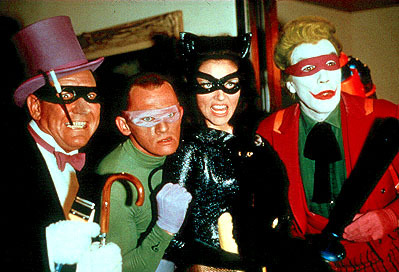 The villains, particularly the Penguin, steal the show, but what’s great about the old Batman series is that everyone is brimming to life with personality and character. Even smaller supporting roles such as Commissioner Gordon and Alfred have their moment in the spotlight. Batman is given some great comic material, downplaying everything with a “goofy seriousness”. My favorite scene in the film is when Batman is trying to get rid of a lit bomb, and he runs through the public streets trying to get rid of it. Everywhere he turns there’s nuns, school children playing, he tries to throw it in the pier and there’s a group of ducklings, until finally he turns to the camera and says “Some days you just can’t get rid of a bomb!” Oh so true. One of my other favorite bits in the film were the times when the heroes were deducing the villains next move: “But wait! It happened at sea. See? C for Catwoman.” “An exploding shark … was pulling my leg.” “The Joker! It all led to a sinister riddle. Riddle -er. Riddler?” And you gotta hand it to Robin for his instantanious deductive reasoning and solving riddles. There’s also a great gag where Batman is in the elevator and reads 7 different languages for the UP button. Then of course the talked about gag with the porpoise that dives in front of an exploding missile saving their lives. It’s all great stuff. It’s funny to see how Batman plays on two different levels, one where kids can take it absolutely seriously, and adults who can enjoy it for the comedy. Because part of the magic with Batman is how it takes itself completely seriously in the midst of it’s absolute silliness. There may never be a show or a movie like it ever again, but Batman: The Movie is one of a kind, and it’s great fun for everybody.